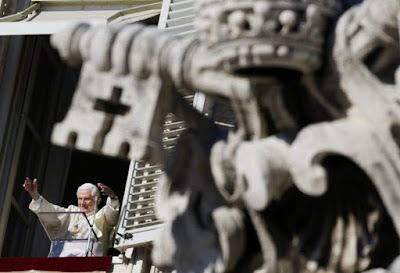 Whispers in the Loggia: "Benedictus, Qui Venit"
First buzzed last fall, the dates reported in January, this morning finally saw the formal announcement that B16 will visit the UK from 16-19 September and, with it, the launch of a PopeTrip webpage. Likewise well-circulated in advance, the four-day pilgrimage to England and Scotland will arguably be headlined by the pontiff's first beatification ceremony that he'll preside over himself -- a West Midlands rite elevating Cardinal John Henry Newman to the penultimate step before sainthood, a move Benedict (himself a Newman devotee) approved last July. The Pope will be received at the Palace of Holyroodhouse [Edinburgh] by Her Majesty The Queen. His Holiness will give a major speech to British civil society at Westminster Hall. He will also visit the West Midlands to beatify the nineteenth century theologian and educationalist Cardinal John Henry Newman at a public mass in Coventry.